HomeAthleticsWhat’s New in Nyack College Men’s Basketball? What’s New in Nyack College Men’s Basketball? August 27, 2018 Deborah Walker Athletics, Rockland Campus Comments Off on What’s New in Nyack College Men’s Basketball? 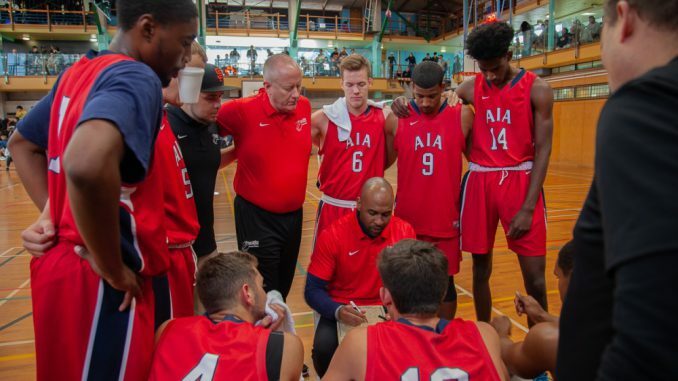 Nyack College Men’s Basketball Head Coach Jason Crafton is fired up after his exhilarating summer of coaching for the nonprofit sports organization, Athletes in Action. He trained Division I and II college players for several days in Los Angeles and then took the team into a West Coast prison for a scrimmage with inmates. In a recent Nyack Warrior Radio podcast, he likened the intensity of the game to the legendary Rucker Park street games in Harlem. Beyond the hoops, it also provided an opportunity to also share hope through the life-changing gospel of Jesus Christ. Coach Crafton spoke with Warrior Radio station manager Brad Hickey about this exciting summer opportunity , which included his travels across the globe to New Zealand. He left the U.S. in summer, but 16 hours later arrived in New Zealand’s winter season where he says temperatures in the gym dipped to 28 degrees Fahrenheit. This once in a lifetime experience for the players was just as fruitful for Coach Crafton who was given another platform for imparting the same integrity and Christian values into the lives of the players from across our nation as he does with his Nyack College team. Tune in to the podcast and learn more about Coach Crafton’s New Zealand trip and also what’s in store for the 2018-2019 basketball season at Nyack.